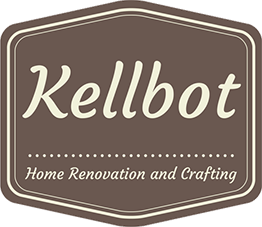 Installing a Modular Rug - Kellbot! | Kellbot! 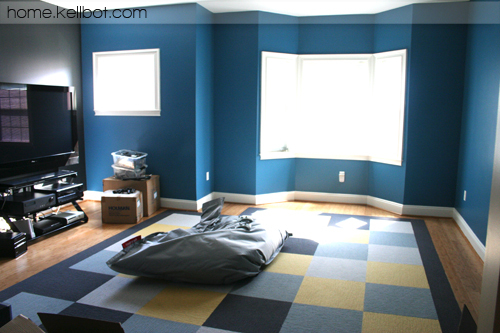 We used the Flor modular rug system in our TV room, which is made up of individual carpet squares you assemble yourself. Each square is 20 by 20 inches. On the underside of each intersection is a small sticker which holds the pieces together. The rubbery backing on the carpet squares keep them from sliding around too much. For the border pieces we cut the squares into thirds. To make the corners line up evenly we needed an extra 2/3 length border piece on the end of the border row. When it’s done you can’t tell that the pieces are separate, though there are a few “fuzzies” that need to be vacuumed up. My cuts weren’t quite as clean as the factory edges, so I turned the cut edge of each border piece in towards the center of the rug. 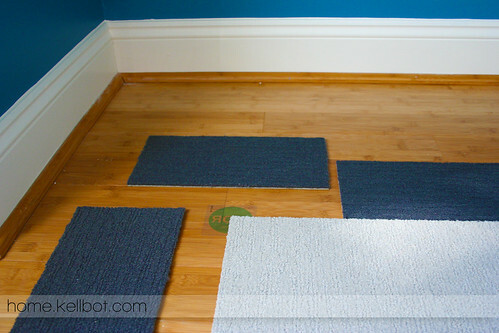 The pieces with two cut edges were used at the back of the rug (shown above), which will eventually be covered by a couch so no one will see it. Overall we’re happy with how it came out, and will likely use the Flor squares in a few other places. PS, notice something different? My blog images are now watermarked, something I’m going to try for a bit. You can read about why I’ve decided to go this route over on the main blog. You should definitely do an update to this once you’ve lived there a bit. I’ve had hardwood floors in the past, and I’d think dust bunnies would love to hang out in the hardwood areas, but I have no data to back that up. Possible the carpet will hang onto most of that? Simply beautiful! I love the blue! 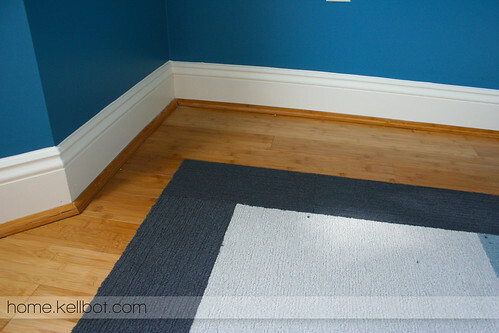 When I first moved into my house, I had debated doing the same to my bedroom floor. It’s hardwood. The protective finish had long since disappeared and were replaced by watermarks. Ultimately, I decided against it. Seeing this is making me question my decision.